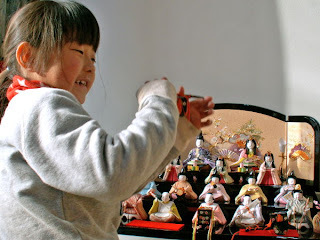 March 3 each year is when hina matsuri (doll festival) is celebrated in Japan. Also known as Girls' Day, ornamental dolls representing the emperor and his royal court are arranged on platforms. Tradition holds that these dolls held the power to lure bad spirits out of the household as they were sent floating down the river in little boats. Given the expense of modern dolls however, this practice of sending them packing has come to an end. Nowadays, these dolls come out of storage long enough for children and grandchildren to marvel at.